This past Sunday was the first of two Radio 104.5 11th Birthday Celebration concerts at BB&T Pavilion. Featuring 11 artists, it was a wide-ranging look at indie rock circa 2018. The following are my favorite moments of the day. *Headliner Thirty Seconds to Mars brought an arena-sized atmosphere to the Camden amphitheater. 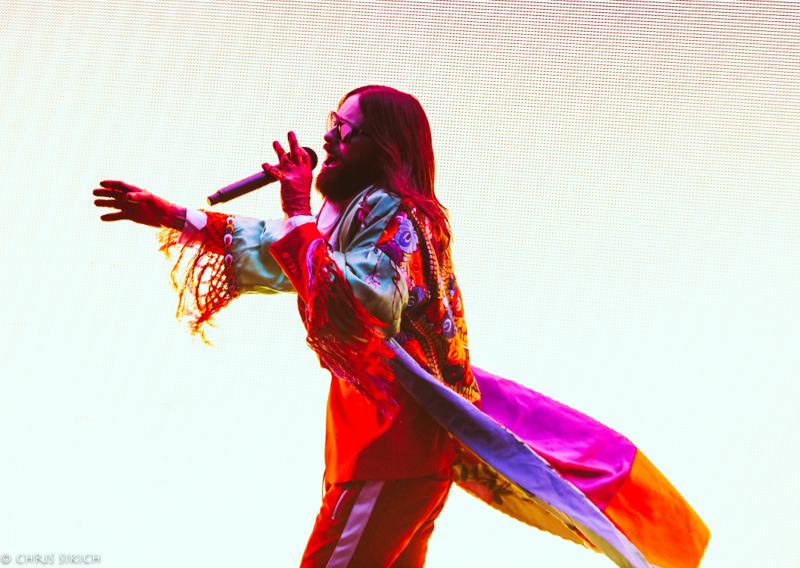 Led by actor and musician extraordinaire Jared Leto, the band brought out science fiction-like light displays and a desire to interact with the crowd. Playing behind the 2018 release America, they were a crowd-pleasing end to the festivities. *Chvrches delivered their delectable brand of pop behind the 2018 Love is Dead. Leader Lauren Mayberry strutted the stage and took her long locks on wild rides during sons new and old. *Misterwives got the crowd moving with their eclectic sounds and looks. Led by Mandy Lee and her radiant stage presence, they were certainly one of the day’s finest moments. *The Utah foursome The Aces rocked the smaller music discovery stage. With their debut album When My Heart Felt Volcanic obviously well known by many in the audience singing along, this young band wowed. *Locally-based Saint Slumber began the day at the main stage with an exciting set of rock. Showing flashes of great potential, they were a great beginning to a day of rock and pop. The rest of the day featured wonderful sets from the likes of Walk the Moon, Joywave, The Neighbourhood, Slenderbodies and L.I.F.T. Copyright ©2018 PopEntertainment.com. All rights reserved. Posted: June 22, 2018. Tags: 104.5 Birthday Celebration, 2018, 30 Seconds to Mars, BB&T Pavilion, camden, Chris Sikich, Chris Sikich Photography, Chvrches, Feel It Still, indie rock, Jared Leto, Joywave, June 17, L.I.F.T., Lauren Mayberry, Live in the Moment, Love is Dead, Mandy Lee, Metallica, Misterwives, NJ, Pink Floyd, Portugal. The Man, Saint Slumber, Slenderbodies, The Aces, The Neighbourhood, Walk the Moon, When My Heart Felt Volcanic. Bookmark the permalink.